Three coins in the fountain, to recall a famous song, is all very well, but one coin in the engine? Not so much. A flight had to be grounded in China after a passenger tossed a piece of loose change into the inner workings of the aircraft “for luck”. Worse, it was the second incident of its type this year. 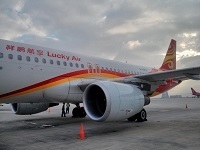 Worse still, the airline is called Lucky Air. We are not making this up. After the elderly woman’s gesture, mechanics were forced to perform a full examination of the engine while the other passengers at Anqing airport in China’s eastern Anhui province had to wait for an alternative flight. Reports said the 76-year-old threw the money because she believed it would bring good fortune – a theory popular in some religions like Buddhism.